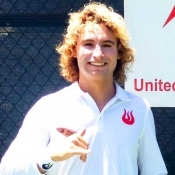 Diego is a Pro Tennis Instructor in Kahuku, Hawaii (on the North Shore) at the Turtle Bay Resort. Having gone pro himself at a young age, Diego decided to instruct up and coming athletes instead. See how his day consists of surfing, instructing tennis on his own dedicated court, and chilling. What a life!